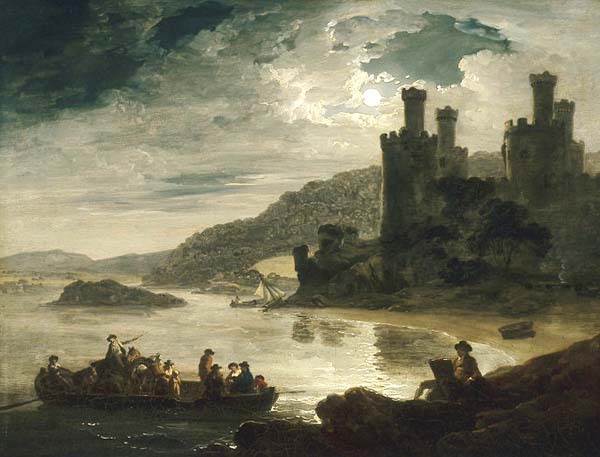 This is how the painter Julius Caesar Ibbetson (1759-1817) interpreted the view of Conwy Castle from the north in 1794. The painting, reproduced by kind permission of the Victoria & Albert Museum, provides an insight into how the Conwy estuary in this vicinity looked before Thomas Telford built the Cob and Suspension Bridge in 1826. The island (which was known as Ynys – Welsh for “island”) clearly shown in the painting was critically important to Telford, since it provided a firm foundation for the bridge’s eastern abutment. The boat in the foreground in the painting is one of the ferryboats which took passengers and goods across the estuary before the bridge was built. Ibbetson may have altered some aspects of the scene to suit his composition. The bank in the foreground appears to have replaced the shoreline spur of the town walls or the gentle slope where the wooden medieval quay once stood. The quiet beach with the lone boat could, however, be an accurate representation of what he saw. At that time, the main harbour was south of the castle, in the sheltered area where the Gyffin stream meets the Conwy estuary. It moved north of the castle after construction of the stone quay in 1833. The sailing boat in the middle distance could be docking at the rivergate entrance to the castle. This feature was destroyed by construction of the western abutment of Telford’s bridge.